Photo and photo permission provided by WATU & Co.
LAS VEGAS – Kenya turns 50 this year, having gained independence in 1963. To celebrate this milestone, Kenyans Connect and WATU & Co., in conjunction with the Embassy of The Republic Of Kenya, Washington, D.C., have organized a series of events to celebrate in support of the Kenya Rugby Sevens team, which will take part in the USA Rugby Sevens Tournament & Fan Festival Feb. 7–10. Festivities will kick off Thursday, Feb. 7, with the USA Sevens Parade of Nations at 6:30 p.m. on Fremont Street. The 4th Annual Kenya Rugby Sevens Meet & Greet Red Carpet Welcome Reception will follow at The Boulevard Theater, 3765 Las Vegas Boulevard, starting at 7:30 p.m. The Kenyan Ambassador to the United States, Elkanah Odembo, will be the guest of honor, and other dignitaries and corporate executives are expected to attend as well. The Kenya Rugby Sevens team and management have been invited and are expected to attend pending their schedule. Attendance is free and open to all via online RSVP, which can be made at https://www.rsvpmenow.com/rsvpbeta/?id=25309. On Friday, Feb. 8, the 2nd Annual Kenyans Connect Golf Tournament will be held at Angel Park Golf Club, 100 S. Rampart, starting at 8 a.m. Cost for the golf tournament is $99 for an individual or $380 for a foursome. Registrations can be made here: http://kenyansconnect.net/golf/. 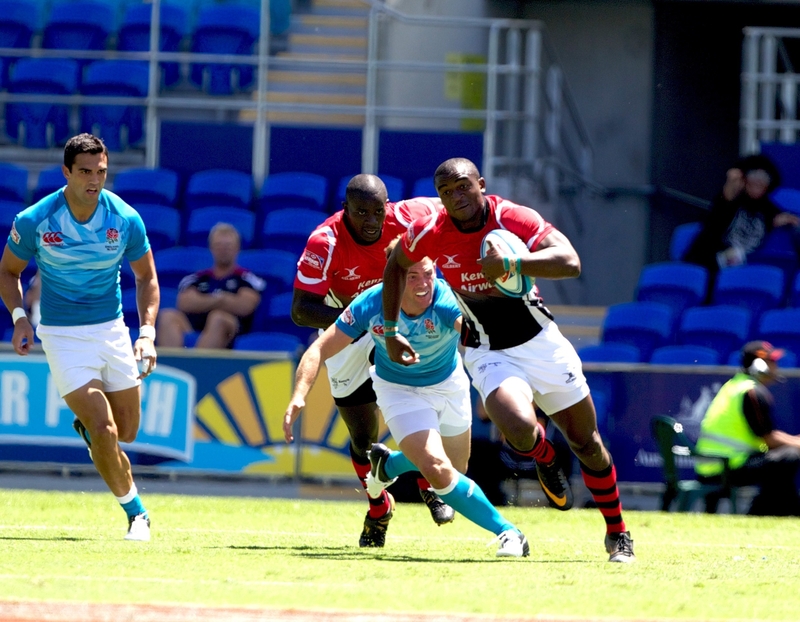 At 4 p.m. on Feb. 8, all Kenya rugby fans will converge at UNLV’s Sam Boyd Stadium, 7000 East Russell Road, for the start of the 5th round of the 2013 HSBC Sevens World Series. For the first time ever, fans and spectators will have the opportunity to experience Kenya in a designated area, dubbed Kenya Korner, at the USA Sevens Fan Festival, an expo festival event that caters to all 60,000 rugby fans and spectators promoting sports, crafts, food and vendors from all 16 represented countries. The newly restructured Kenya Rugby Sevens team is having some of their best performances this season and will be one of the favorites at the tournament. They are currently ranked sixth in the world. Watu & Co. will have a booth at the Rugby Sevens Fan Festival, where they will sell Kenyan food including Kenyan tea and coffee, beef and veggie samosas, masala chips, mandazi, and an assortment of sodas and juices. The Kenyan diaspora and fans will continue with the rugby games Saturday, Feb. 9, and Sunday Feb. 10. Tickets for the 2013 USA Sevens Rugby tournament can be purchased here: http://www.usasevens.com/las-vegas/tickets/. For more information, visit www.kenyansconnect.net. Kenyans Connect and WATU & Co. are diaspora organizations headquartered in the United States. They produce events with the aim to leverage the presence of, and cater to the needs of, Kenyan diaspora, while providing a link for interested stakeholders in Kenya, including the private sector and relevant government agencies. Elkanah Odembo, Embassy of The Republic Of Kenya Washington D.C., Jennifer Gachui, Kenya, Kenya Rugby Sevens team, Kenyan diaspora, Kenyans Connect, USA Rugby Sevens Tournament & Fan Festival, USA Sevens Parade of Nations, WATU & Co.